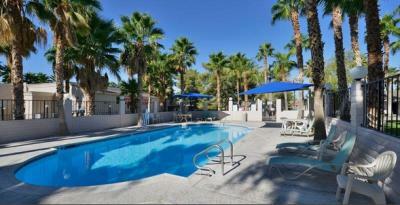 The Best Western Pahrump Oasis offers two pools. PAHRUMP, NV—Hospitality Management Corp. is now managing the 92-room Best Western Pahrump Oasis, located an hour’s drive from Las Vegas. The hotel is within two miles of Pahrump Valley Vineyards and near to area attractions such as Death Valley, Spring Mountain Racetrack, Tecopa Hot Springs, Bonnie Rich Ranch and the Ash Meadows National Wildlife Refuge. Hotel amenities include two outdoor swimming pools, hot tubs, business center, a restaurant/bar that includes a four-lane bowling alley and pool tables, complimentary breakfast, WiFi, miniature bowling and video games. In addition, 13 suites offer fully equipped kitchenettes.